are almost twice as likely to develop heart disease. With three decades serving the Long Island community, we are dedicated to excellent patient care in a compassionate and comfortable environment. 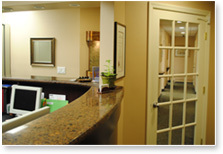 We take pride in using the highest accepted standards, offering alternatives, and focusing on conservative treatment. Dr. Margolis, Dr. Abbatiello, Dr. Mender & Dr. Toscano brought their expertise and talent together to provide patients with the best possible experience. We have combined a specially designed modern facility with our caring and knowledgeable staff, many of which have been with us for more than 25 years, to give you state-of-the-art care. Please call us if you have any further questions or to set up an appointment. natural replacement for missing teeth and help to prevent face disfiguring bone loss. Periodontal disease is an ongoing bacterial infection in the gums and bone around your teeth. This infection leads to an inflammation under the gums, and if not treated can destroy bone around your teeth. 75% of all adult tooth loss is due to periodontal infection.